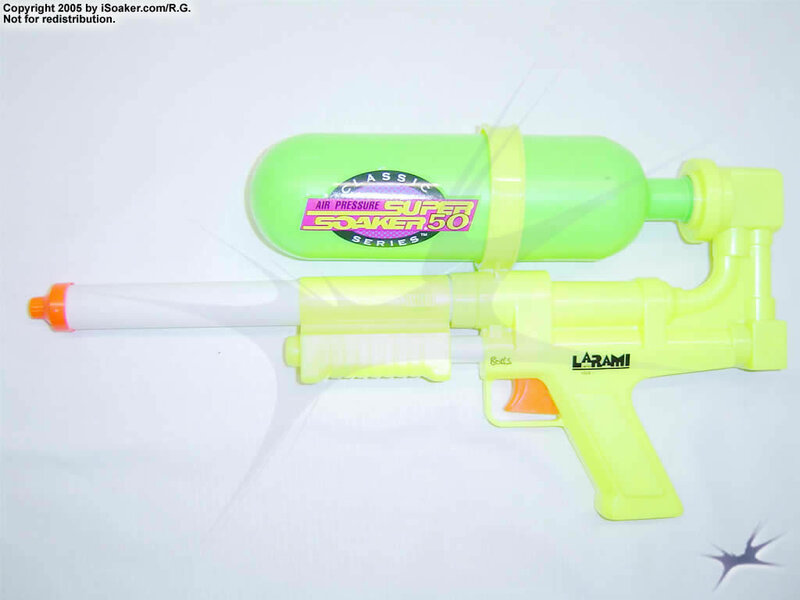 The Super Soaker SS 50: Classic Series is a remake of the original Super Soaker SS 50. Its design was slightly altered giving it a shorter barrel and pump grip as well as a slightly smaller water reservoir. It does, however, feel a little better built in one's hands. As with the original Super Soaker SS 50, the SS 50: Classic Series relies on its pressurized reservoir to power its small, but adequate nozzle. Power-wise, the SS 50: Classic Series does seem to provide slightly more power than the original, but this may also be due to the fact that it is newer. Compared to the blasters in the XP, CPS or SC-series, the Super Soaker SS 50: Classic Series really feels underpowered. However, it is still distributed by Larami Ltd. as a reminder of the water weapon which made them famous. Small, light, easy to carry. Rate of fire-to-water supply ratio quite good and can last a fairly long time (though water yield is low). This is one of the weapons which helped change water war forever.